The service isn't really free and violates user privacy, the scientists say. Close to 50 faculty members of the Indian Institutes of Technology and Indian Institute of Science on Tuesday released a statement highlighting flaws in Facebook's controversial Free Basics programme. Free Basics is a subsidised internet platform that gives users Facebook and a few other services for free. Facebook says this will help connect India’s poor people to the internet. However, critics claim that it works against the rules of net neutrality, according to which all material on the Internet should be treated equally by internet service providers. Only a few products and websites, including Facebook, can be accessed through Free Basics. The debate about the platform has been especially heated over the past few days because the Telecom Regulatory Authority of India set Wednesday as a deadline for the public to submit their opinions about whether the service should be allowed. On Tuesday, a group of academics weighed in, claiming that Free Basics will limit the freedom with which Indians can use their own public utility, the internet. is a lethal combination which will lead to total lack of freedom on how Indians can use their own public utility, the Internet. Facebook's “free basics” proposal is such a lethal combination, having several deep flaws, beneath the veil of altruism wrapped around it in TV and other media advertisements, as detailed below. Flaw 1: Facebook defines what is “basic”. The first obvious flaw in the proposal is that Facebook assumes control of defining what a “basic” service is. They have in fact set up an interface for services to “submit” themselves to Facebook for approval to be a “basic” service. This means: what are the “basic” digital services Indians will access using their own air waves will be decided by a private corporation, and that too one based on foreign soil. The sheer absurdity of this is too obvious to point out. One does not know what the Ministry of Defence (MoD) set out to achieve in the calendar year 2015 or the current financial year that will draw to a close in another three months. But if one were to hazard a guess, the objective would have been to take steps, if not to completely resolve, at least address the issues that kept the MoD in the news throughout the year. A quick survey of where we stand on those issues at the end of the year would be instructive. To cut to the chase, the issues confronting the defence establishment at the beginning of the year broadly related to defence policy, human resource management and operational preparedness, though not necessarily in that order. The policy-related issues are not new. Questions about India’s national security objectives and defence strategy, in all their manifestations, have persisted for long. To be fair, these larger issues were not in the forefront at the beginning of the year but a related issue was. It concerned the appointment of a Chief of Defence Staff (CDS) or Permanent Chief of the Chiefs of Staff Committee (PC COSC). The year has gone by without one being appointed. If anything, the excitement seems to have somewhat ebbed over the past few months. It will take some doing to create this institution with clearly defined responsibilities and an appropriate support structure. Assuming that the present system of three-tiered defence planning will continue and, among other things, the CDS/PC COSC will be responsible for defence planning, it is time the issue is taken up on priority as the 13th Defence Five-year Plan is to commence from April 1, 2017. Arunachal Pradesh is no ordinary state, it is a hyper-sensitive bone of diplomatic contention with China and with the winds of local insurgency sweeping the Northeast, it is also susceptible to errors of omission and commission on the free-flowing democratic and constitutional impulses of the border state. History is replete with unfortunate instances of playing partisan politics and compromising on constitutional freedom (e.g. Jammu and Kashmir in the ’80s and ’90s) that had triggered local separatist tendencies in the veritable tinderbox of any border state. Therefore, it is even more important to demonstrate our finest constitutional commitment and guarantees as a nation to ward of any external and internal questions on the correctness of all political and executive actions. The gubernatorial disquiet in Arunachal Pradesh begets a more profound inquiry than the one that often gets mired in the legalities and technicalities of constitutional articles and clauses. J.P. Rajkhowa was the preferred choice of the prevailing political dispensation at the Centre and, therefore, chosen to replace the incumbent midterm as the 19th governor of Arunachal Pradesh. Questions were raised at the time about an Assamese in the Itanagar Raj Bhawan, given the fractious sentiment and scepticism of the Arunachalese with regard to Assam and its unresolved border disputes that are felt locally to be even more important, than the ones with China on the McMahon Line. But every Central government is in its democratic right to select and appoint the person it deems most appropriate to uphold the tenets and spirit of the Indian Constitution and rise beyond partisan politics, thus, the filter of not selecting an incumbent from the state, or one who has participated in active politics recently, has ideally detached him/herself from local politics of the state. New Delhi, Dec. 29: In Prime Minister Narendra Modi's showpiece "Make in India" project to be opened this Sunday, a public sector firm has beaten Anil Ambani's Reliance Defence that was lobbying to make Russian helicopters. Moscow announced last night that the Russian state arms export agency, Rosoboronexport, and the chopper-maker, Rostec, have chosen the Indian defence undertaking Hindustan Aeronautics Ltd (HAL) to make the Kamov 226t "Sergei" light utility helicopters for the military. India's army and air force have a requirement of 200 such reconnaissance and surveillance helicopters immediately to replace the Cheetah and Chetak machines that currently undertake the task. The initial order is estimated to be worth $1 billion. Most of the Cheetah and Chetak helicopters are more than 40 years old and have a high rate of accidents. Earlier this year, the wives and widows of military officers who fly/have flown the Cheetahs and Chetaks urged the government to replace them. The total order for Sergeis could go up to 400 with the navy also projecting the requirement. The process of replacement has taken more than 10 years. The Prime Minister, who returned from Russia last week, is scheduled to lay the foundation stone of a HAL facility to make helicopters at Tumkur, 100km from Bangalore, this Sunday. *** Brave New War A new form of conflict emerged in 2015—from the Islamic State to the South China Sea. From China in Asia to Russia in Europe and the Middle East, and ISIS just about everywhere, 2015 has seen the flourishing of conflicts that exist in a gray zone, one which is not quite open war but more than regular competition, which is attuned to globalization, which liberal democracies are ill-equipped to deal with, and which may well be the way power is exercised and conflict conducted in the foreseeable future. Described by scholars as “hybrid,” “full-spectrum,” “non-linear,” “next-generation,” or “ambiguous”—the variations in the description indicate the slipperiness of the subject—these conflicts mix psychological, media, economic, cyber, and military operations without requiring a declaration of war. In the case of Russia’s ongoing campaign in Ukraine, for example, hyper-intense Russian propaganda has cultivated unrest inside the country by sowing enmity among segments of Ukrainian society and confusing the West with waves of disinformation, while Russian proxy forces and covert troops launch just enough military offensives to ensure that the Ukrainian government looks weak. The point is not to occupy territory—Russia could easily annex rebel-held eastern Ukraine—but to destabilize Ukraine psychologically and advance a narrative of the country as a “failed state,” thus destroying the will and support inside Ukraine and internationally for reforms that would make Kiev more independent from Moscow and might, in the longer term, create hope for democratic reform inside Russia. An immediate aim of the Three Warfares is to spread China’s dominion over the South China Sea, extending the country’s maritime borders beyond boundaries recognized by the UN Convention on the Law of the Sea in order to control massive energy reserves and strategic sea-lanes worth $5 trillion dollars; ultimately, the hope is to supplant the United States as the security guarantor in the region. The military strategy was first adopted in 2003, but many of its consequences only became apparent to the media in 2015. First China has ramped up the construction of artificial islands in contested waters. Then it has used “lawfare” to claim that since these islands are now its territory, it owns the surrounding seaways under maritime law. This claim is reinforced by “psychological” warfare, which involves threatening economic sanctions against states that protest China’s moves and intimidating anyone who strays into the area. Recently, a BBC reporter who flew in international airspace near a Chinese military airstrip constructed off the coast of the Philippines was bombarded by calls over the airwaves stating: “Foreign military aircraft in northwest of Meiji Reef, this is the Chinese Navy, you are threatening the security of our station.” And then there’s “media warfare”: Developments such as Japan beefing up its military, or the U.S. insisting on sailing its ships through waters the UN considers neutral, are depicted in China’s ever-expanding international news networks as examples of the aggression of China’s rivals, rather than a response to Chinese expansion. Beijing, Xinjiang and the Press China shows its lack of confidence by expelling a foreign journalist. 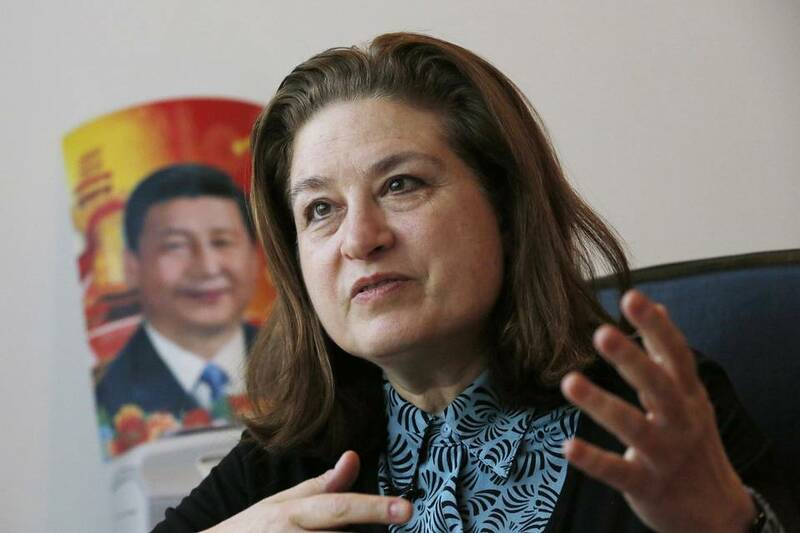 The Chinese Foreign Ministry’s Dec. 26 decision not to renew the credentials of French journalist Ursula Gauthier, the first such expulsion in three years, suggests that Beijing is escalating pressure on foreign journalists. It also shows how sensitive the Communist Party is to criticism of its harsh policies against ethnic minorities. Under Party General Secretary Xi Jinping, plainclothes police increasingly manhandle foreign reporters, and the Foreign Ministry holds up visa applications for publications that have reported on the wealth of top leaders. Ms. Gauthier’s offense was writing, five days after the Nov. 13 Paris terrorist attacks, about the Chinese government’s attempt to draw a parallel to violence in the Muslim-majority region of Xinjiang. The Beijing correspondent for the newspaper L’Obs questioned China’s claim that a Sept. 18 incident that claimed 50 lives in the town of Baicheng was comparable to Paris massacre. Beijing wants to justify its human-rights abuses in Xinjiang as a necessary response to the rise of Islamic fundamentalism and separatism. But as Ms. Gauthier pointed out, central-government policies are driving the native Uighur population, which practices a moderate form of Islam, to desperate acts of violence. The state tightly restricts Uighurs’ practice of religion, freedom of movement and even the use of their own language. Broken resolutions are one of the key features of every American New Year’s celebration, and calling for integrity in an election year may be a particularly good way to ensure that any resolutions that follow will be broken early and often. Ever since the ISIS attacks in Paris, however, politics, the struggle for media visibility, and the business side of “selling” counterterrorism have all combined to turn a real but limited threat from terrorism into a form of panic. Worse, they have combined to turn some aspects of counterterrorism into prejudice and bigotry against Muslims and Arabs. The end result has been calls for new measures that will actually serve the key objectives that movements like ISIS and Al Qaeda have in launching such attacks on the West. They will divide the West from the Muslim world and key Arab and Muslim partners in the fight against terrorism, and alienate the Muslim minorities in the United States and other Western and secular states. Stop exaggerating the threat: Terrorism is all too real and no one can deny that it repeatedly ends in tragedy. At the same time, it needs to be kept in proportion. The real world risks of terrorism in the United States fall short of virtually any other common cause of injury, death, and economic loss. To put these risks in perspective, the number of deaths from terrorism in the United States since 9/11 have been so low that Americans may well face a higher cumulative probability of dying from traffic accidents, food poisoning, crime and other causes if they celebrate a single New Year’s Eve than they do from terrorism over an entire year. History has taught us that when an armed conflict arises between two belligerents, countries with interests in the outcome of that conflict either need to pick a winner, a loser, or stay out of the conflict. If containment or maintaining the status quo is chosen it naturally results in perpetual conflicts, e.g., Israel and the Palestinian Liberation Organization (PLO) /Hezbollah. In this scenario, the weaker belligerent is never defeated through armed conflict or forced to recognize that eventuality. They are allowed to carry on in the conflict. The weaker belligerent never has reason to seek peace terms as a part of their surrender, and is free to continue to harass its opponent because a state or non-state actor, like the United Nations, maintains the status quo regardless of how chaotic that is for regional or international stability. The best choice a state can make is to decide which side it supports and give war a chance, in order to remove the other belligerent so that true stability can be achieved. As political commentator David Webb noted, “If we [the U.S.] take out ISIS, we have Assad. If we take out Assad, we have ISIS. If we take out both, we have a vacuum.” It’s clear from U.S. leaders, whether they be executive, congressional, or presidential hopefuls, that U.S. troops on the ground are not the solution the U.S. is seeking. Senator Rand Paul speaking more broadly on terrorism said, “If we want to defeat terrorism…the boots on the ground need to be Arab boots on the ground.” NATO General Secretary Jens Stoltenberg revealed to Reuters that NATO will not send any ground troops to combat Daesh. As a result, if the U.S. wants to defeat Daesh, the boots on the ground need to be Kurdish boots, a viable ally for the U.S. to support. There is no need for the U.S. to roll the dice on supporting “moderate” jihadist groups when it has a known partner it has been working with for over a decade in Iraq. This paper discusses Kurdistan’s demographics, economy, and, most importantly, its military capabilities which will demonstrate Kurdistan’s viability as a permanent regional partner. It also examines the effects recognizing Kurdistan as an independent state to defeat Daesh will have on Turkey, Iraq, other regional allies, and Russia’s burgeoning Shia alliance. Why do all the powers supposedly arrayed against the terrorist organization calling itself the Islamic State (IS) seem incapable to date of effectively hitting its strongholds in Syria? Is it fear of civilian casualties, which are unavoidable in any large-scale military operation? This might indeed be a factor in the case of the United States, France and the UK, which have scrupulous legal rules and militaries that actually care about such things. But this cannot explain the behavior of Russia and the Assad regime which, it should be clear by now, care not a whit for such “modern” and “Western,” not to mention “impractical,” concerns. Indeed, the willingness of both to inflict such casualties, often intentionally, is on display every day and is well-documented. I do not believe that fear of civilian casualties fully explains Western behavior either. After all, there are quite a few installations where IS maintains a presence that are located outside densely populated areas and that could, I suspect, be targeted with minimal human collateral damage. But striking these installations carries risks and costs far beyond any immediate loss to IS. So, what is it that lurks behind the near universal decision to avoid bombing these installations and IS strongholds, except on a minimalist basis? The short answer, I suspect, is something quite sinister that is worth airing openly: the Islamic State has a kind of doomsday threat that has all of the intervening powers over a barrel. The People’s Liberation Army Navy (PLAN) has commissioned three vessels, including a Dongdiao-class (Type 815) auxiliary general intelligence (AGI) ship, into its South Sea Fleet, the semi-official PLA Daily reported on 28 December. The vessels were commissioned in a ceremony held at an unspecified naval port, said to be in the South China Sea, on 26 December. The Dongdiao-class vessel (which PLA Daily refers to as the ‘Type 815G’) has been named Neptune and given the pennant number 852. IHS Jane’s reported in April 2014 that the vessel was launched at the Hudong Zhonghua Shipbuilding Group’s yard in Shanghai in March the same year. Neptune is the third known Dongdiao-class vessel in service with the PLAN. First-of-class Beijixing (851) is based in the service’s East Sea Fleet while second ship Tianwangxing (853) is also based in the South Sea Fleet. According to IHS Jane’s Fighting Ships , the 6,096-tonne platform has an overall length of 130 m, an overall beam of 16.4 m, and a hull draught of 6.5 m. The ship has a top speed of 20 kt and can carry a crew of 250 and one medium helicopter. The Dongdiao-class is armed with one 37 mm and two 14.5 mm guns. Given the climate of U.S. public opinion about U.S. intervention in the Middle East it is not surprising that the current administration has focused its foreign policy objectives on counter-terrorism. But that priority limits our position to a defensive one. Further, the term “terrorist organization” offers little insight and limits our understanding and approach. ISIS is an insurgent organization using terrorism as a tactic. The American public is wary of getting into what it views as quagmires, particularly in the Middle East, but is less hesitant when it comes to fighting terrorists who we view as a direct threat to the US. As a result, we have intervened in Syria to fight ISIS but not Assad. While ISIS certainly employs terrorism as a tactic, and the label is one that de-legitimizes an opponent, the label also obscures the facts. To call it a terrorist organization is to mislabel it. Traditionally, groups were identified as terrorist groups if their goal was ultimately to effect policy through intimidation. The policies in question were regionally specific: Ireland, Israel, even as specific as the green line separating Muslims and Christians in Beirut. What we are witnessing now is something closer to criminal psychopathology than terrorism. And the aims of these groups are not regionally specific but often international in scope. Moreover, the tactics have gone beyond intimidation to affect policy. Multi-million-dollar advertising money has long been suspected as an unspoken filter for Western news media coverage. If the news conflicts with advertising interests then it is simply dropped. An example of this is coverage of the conflict in Yemen. Take three major Western media outlets BBC, CNN, France 24. All are notable for their dearth of news coverage on the bloody conflict in Yemen. It also turns out not coincidently that major advertisers on these same news channels include Qatar Airways, Emirates and Etihad. The latter two feature celebrities Jennifer Aniston and Nicole Kidman, posing as satisfied customers of these Gulf state-owned companies. Other prominent advertisers on BBC, CNN and France 24are Turkish Airlines and the Government of Bahrain’s Business Friendly Bahrain campaign. This advertising complex has a direct bearing on why the three mentioned Western news channels do not give any meaningful coverage of Yemen. The poorest country in the Arab region is being bombed by a coalition of states that include Saudi Arabia, Qatar, the United Arab Emirates and Bahrain and is backed by the US and Britain. Thousands of Yemeni civilians have been killed, half of the population is in dire humanitarian conditions from lack of food, water and medicine, according to the United Nations. Due to Western involvement in the humanitarian disaster unfolding in Yemen, one might think that Western media would cover the conflict extensively but not if you watch BBC, CNN or France 24. There are reliable reports that ground forces fighting against the rebels in Yemen are comprised of Western mercenaries in addition to troops from Saudi Arabia, Bahrain and the UAE. According to Lebanon's Al Manar news outlet, foreign mercenaries from France, the UK, Australia, Colombia and some Latin American countries have been killed. The mercenaries are first sent to the UAE for training before dispatch to Yemen. As with many aspects of modern banking, the word “bankrupt” has its roots in Renaissance Italy. The original banks were Florentine merchants who would sit in the open street behind benches (bancas in Italian) upon which their money would be stacked. If trading went against them and their capital was reduced to nothing, their bench would be said to be broken, or banca rotta. It is fitting then that, 500 years later, the European country with the most worrying debt problem is Italy. This may be surprising to some, since Italy does not top the tables as worst offender by any of the usual metrics. It does not have the highest levels of debt to gross domestic product in Europe: That dubious honor belongs to Greece, whose debt to GDP ratio rests more than 40 points higher than Italy’s 132%. Nor are Italian banks afflicted with the highest quantities of nonperforming loans as a percentage of GDP. Cyprus wins that contest easily; at a staggering 137%, it relegates Ireland (23%) to a distant second place and far exceeds Italy at 17%. But though Italy is not the worst offender, its size still makes it the most potentially problematic. Italy has the third largest economy in the eurozone after Germany and France, and it is 1.5 times bigger than fourth-ranked Spain. 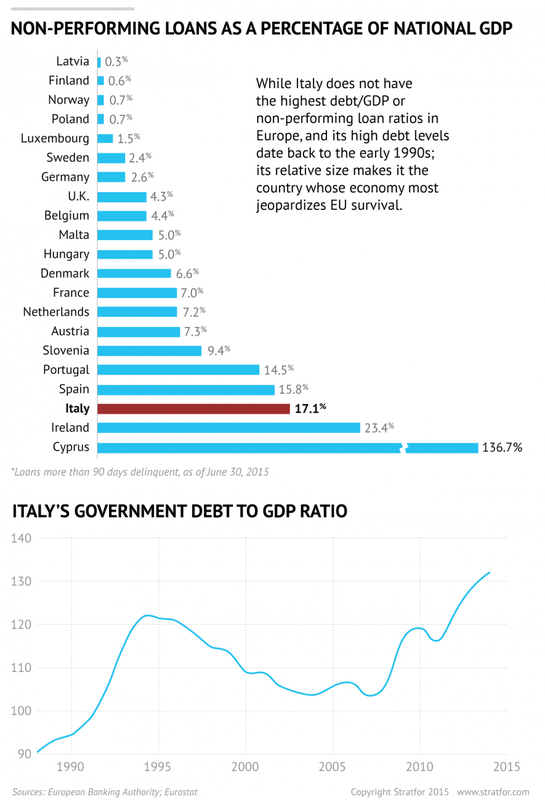 So even without having the highest ratios, in actual numbers Italy has the biggest debt mountain: 2.3 trillion euros (roughly $2.4 trillion) of government debt compared with Greece’s 392 billion euros. Thus the three recent Greek bailouts, though giant in relation to the Greek economy, were just a sliver of the European economy as a whole, and in their wake the eurozone carried on more or less unaffected. The same would not be true of Italy. A bailout would be a massive undertaking that would greatly stretch the union’s finances. Of course, this is not an altogether new phenomenon. Italy’s debt to GDP ratio has been over 100% since the early 1990s, and GDP growth since then has been fairly stagnant. But the fact that Italy’s debt has been large for a long time does not mean it is not dangerous. It was the threat of Italy defaulting that drove much of the market panic during the sovereign debt crisis in 2011 and 2012, when weakness in Europe’s banks had prompted bailouts from their national governments, calling into question the solvency of the governments themselves. The world will face economic challenges on multiple fronts in 2016. As the U.S. Federal Reserve begins its monetary tightening, Europe is struggling to manage migrant and debt crises, China's financial stability is in doubt, and emerging economies are increasingly fragile. The global economy "could be doing much worse," writes CFR Senior Fellow and Harvard economist Kenneth Rogoff. Low oil prices and weak currencies are keeping the European and Japanese economies afloat, but Rogoff warns of "a slowing Chinese economy, collapsing commodity prices, and the beginning of the U.S. Federal Reserve's rate-hiking cycle." Emerging economies like Brazil, South Africa, Thailand, and Turkey, rather than China, will be the real sources of concern in 2016, argues U.C. Berkeley's Barry Eichengreen. With their high levels of short-term debt, these countries are vulnerable to currency crisis, "potentially leading to economic collapse." For CFR's Varun Sivaram, new investments announced at the Paris climate talks are reason for optimism in the energy sector. In particular, the $20 billion earmarked for clean energy research and development "could make it more likely for breakthrough technologies to emerge." In the United States, meanwhile, steady GDP and job growth has been constrained by weak productivity gains, writes American Enterprise Institute's James Pethokoukis. Without increased productivity delivering higher living standards, the United States could face decades of "unhealthy economic populism." Europe continues to face the risk of debt crises, writes CFR's Robert Kahn, but the most dangerous economic risk for the continent in 2016 is "a growing populist challenge from both the Left and Right," which could create economic policy uncertainty and constrain policymakers. In the developed world, we have become used to having devices that connect and inform us and provide services on demand, and the developing world has largely been in the dark. As of 2015, however, nearly half of China’s population and a fifth of India’s population have gained Internet connectivity. India now has more Internet users than does the U.S., and China has twice as many. Smartphones with the capabilities of today’s iPhone will cost less than $50 by 2020. By then, the efforts of Facebook, Google, OneWeb, and SpaceX to blanket the Earth with inexpensive Internet access through drones, balloons, and microsatellites will surely bear fruit. This means that we will see another three billion people come on line. Never before has all of humanity been connected in this way. This will be particularly transformative for the developing world. Knowledge has always been a privilege of the rich; tyrants rule by keeping their populations ignorant. Soon, everyone, everywhere, will have access to the ocean of knowledge on the Internet. They will be able to learn about scientific advances as they happen. Social media will enable billions of people to share their experiences and help one another. Workers in the remotest villages of Africa will be able to offer digital services to the elite in Silicon Valley. Farmers will be able learn how to improve crop yields; artisans will gain access to global markets; and economies based on smartphone apps will flourish everywhere. All of this has been made possible by advances in computing and networks. In a progression called Moore’s Law, computers continually get faster, cheaper, and smaller, doubling in speed every 18 months. Our $100 smartphones are more powerful than the supercomputers of the 1970s—which cost millions of dollars. With faster computers, it becomes possible to design more powerful sensors and artificial-intelligence (A.I.) systems. With better sensors, we can develop sophisticated medical devices, drone-based delivery systems, and smart cities; and, with A.I., we can develop self-driving cars, voice-recognition systems, and digital doctors. Yes, I am talking about applications that can diagnose our medical condition and prescribe remedies. In 2015, smartphone-connected medical devices came into the mainstream. Most notably, Apple released a watch that, using a heart-rate sensor and accelerometer, can keep track of vital signs, activity, and lifestyles. Through its free Research Kit app, Apple provided the ability to monitor, on a global scale, the use of medicines and their efficacy. Microsoft, IBM, Samsung, and Google too, as well as a host of startups, are developing sensors and A.I.-based tools to do the work of doctors. These technologies are expensive and geared for the developed world; but companies in China, India, and Africa are working on inexpensive versions. The sensors that these devices use, and the computing and storage that A.I. systems need cost very little. Previous generations of medical advances were for the rich; now all can benefit. The Air Force is using tablets as electronic flight bags to replace bulky paper-based maintenance and flight manuals. Smartphones and tablets are rapidly making their way into military operations, trimming costs and giving warfighters tightly focused capabilities. But these benefits raise a host of challenges, ranging from security and the need for ruggedization, to requirements for peripherals that link to devices designed for consumers, not soldiers. Military leaders are endorsing the role of these handheld systems, though their implementation may evolve slowly, as technical specialists grapple with myriad issues. Military electronics have always been designed for specific roles and given to select personnel. Now, technology experts must grapple with the emerging bring your own device (BYOD) movement, in which rapidly-changing equipment from Apple and a range of Android suppliers must all be connected in compatible networks. The spectrum of challenges is as varied as the systems themselves. Security and reliability are foremost among them. These traits span many fields, from supplying peripherals such as secure GPS receivers to securing equipment and managing apps developed by suppliers and warfighters. Tablets and smartphones are self-contained devices that can be operated without additional hardware, but many military users will need peripherals that augment built-in equipment. For example, commercial equipment suppliers don’t worry much about security when they incorporate GPS receivers. But military users need GPS data that’s accurate and reliable. If the defense marketplace operated like the commercial world, everyone from the acquisition experts to troops on the ground could expect to be wowed with nearly every new procurement of technology and equipment. Given the unique requirements for tactical products, however, things tend to move more incrementally. New technology capabilities developed for commercial purposes are consistently being implemented in areas such as location-based services, imagery analysis, logistics and mobile computing. This is often occurring on a more ad hoc basis or through pilots that aren't tied to an overall strategy designed to meet the military’s stringent requirements for security, reliability, connectivity and interoperability. With rapid advancements in technology, there is a renewed opportunity to increase the pace of adoption and push for continued innovation. Now is the time for the Department of Defense to develop a more holistic plan to accelerate the move of commercial technologies to the tactical edge. Providing a strategic vision across the services can accelerate the efficient integration of commercial off-the-shelf (COTS) equipment into existing systems and help industry partners understand where research and development investments are needed. For example, take the multitude of connected technologies that are creating the Internet of Things (IoT). Many benefits of IoT networks are self-evident, appearing all around us in the commercial world for personal or industrial use: connected home security, personal health, mobile sensors for remote monitoring of equipment, automated communication between vehicles, and even environmental monitoring. Some of these offer substantial benefits to military missions in terms of both capabilities and cost effectiveness. And certainly, there is an increase in military units training and deploying with COTS equipment and systems. Not everyone is a fan of Internet.org, Facebook's non-profit that aims to introduce cheap internet access to "the most disadvantaged" parts of the world. Since its February rollout in India, several big companies from that country, including a giant media firm and a major travel portal, have withdrawn from the service, claiming it conflicts with the spirit of net neutrality. Responding to the backlash in India, Zuckerberg has defended Internet.org and its Free Basics internet service numerous times — once in an April article for the Hindustan Times (and in a Facebook post with the same text), and later again in a November post on Facebook. He says "net neutrality and universal connectivity must co-exist." On Monday, Zuckerberg penned a blog post for the Times of India, declaring "Free Basics protects net neutrality." "In every society, there are certain basic services that are so important for people’s wellbeing that we expect everyone to be able to access them freely," Zuckerberg said. "We have collections of free basic books. They’re called libraries. They don’t contain every book, but they still provide a world of good... That’s why everyone also deserves access to free basic internet services." *** Congress Has Embraced Unconventional Warfare: Will the US Military and The Rest of the US Government? With the passage of the National Defense Authorization Act of 2016 the United States Congress has embraced what Russia, Iran, China, Al Qaeda and even ISIS have long known and that is unconventional warfare (UW) is a form of warfare that is optimized for achieving national objectives in the space between peace and war. Congress, in Section 1097, has directed the Secretary of Defense to develop a strategy to counter unconventional warfare being conducted by adversaries of the US. Congress recognizes the US has a strategy gap between peace and war and the directive to the SECDEF is the forcing function necessary to develop a strategy and to bring new and creative thinking to the national security challenges we face. However, our adversaries employ their own unique forms of unconventional warfare by effectively integrating conventional and special operations forces, all elements of their national power, and in particular psychological warfare, while exploiting conditions, to include resistance, in countries and regions around the world to counter the west and often the US directly in order to achieve their political and security objectives. They take a more holistic approach to unconventional warfare and are willing to employ it as a matter of course. In contrast the US has long viewed unconventional warfare as something only Special Forces conduct and then only to be used in very rare situations when there are no other alternatives. In short, in the past the US has shown it does not have the stomach for unconventional warfare. Fortunately, Congress has recognized this shortfall in US security strategy. DOD has 180 days to provide to Congress a strategy to counter unconventional warfare. The clock is ticking. It will be interesting to read the response to Section 1097. One possible bureaucratic course of action would consist of reviewing what the Department is already doing and showing the metrics of terrorists removed from the battlefield and listing all the capabilities the Department has that are and can be used to counter-unconventional warfare. The Department will even tout the new joint unconventional warfare doctrine from the United States Special Operations Command (USSOCOM) the Joint Chiefs of Staff approved in September 2015. The purpose of this course of action would be to meet the Congressional requirement with minimal disruption to the department and thus get Congress off its back. Another course of action would be to view this as an opportunity for Congressional support of a new strategy that would be based on a thorough understanding of our adversaries’ strategies and how they are employing unconventional warfare. The question is how with the department respond? Since the recent tragic terrorist attack in San Bernardino, California-where a radicalized Muslim couple gunned down 14 people at a holiday office party-much attention has been focused on the wife, Tashfeen Malik, a Pakistani national. She was allowed into the US in 2014 on a type of visa for people who plan to marry American citizens. Malik’s jhadist messages were direct, private ones rather than communicated through social media. Mr. Comey also spoke more broadly about the role social media played in the recruitment of extremists. “Twitter works as a way to sell books, as a way to promote movies, and it works as a way to crowdsource terrorism – to sell murder,” he said. Consequently, reforming the visa screening process has become a high priority in Washington, DC, where both the Department of Homeland Security (DHS) and the State Department have indicated they are considering tighter scrutiny of applicants’ social media activities. Several bipartisan measures also are under way in the House and the Senate that would mandate increased social media screening protocols in the visa approval process. WASHINGTON — They are taking on a larger combat role in Afghanistan, where the war was supposed to be over. They are headed to Syria to help fight the Islamic State in its stronghold. And President Obama recently ordered nearly 300 of them to Cameroon to assist African troops in their battle against a militant group that has pledged loyalty to the Islamic State. With the Middle East in tumult, radical groups holding swaths of territory in Africa, and a presidential campaign fanning fears of a growing terrorism threat, the White House has steadily expanded the global missions of American Special Operations troops. Even as Mr. Obama has repeatedly said that he opposes American “boots on the ground” in far-flung parts of the world, his administration continues to carve out exceptions for Special Operations forces — with American officials often resorting to linguistic contortions to mask the forces’ combat role. The Obama administration long ago showed its inclination to rely on Special Operations troops and clandestine missions as an alternative to large wars of occupation. But the spread of the Islamic State over the past year — from its hubs in Syria and Iraq to affiliates in Africa and South Asia — has led the White House to turn to elite troops to try to snuff out crises in numerous locations. These deployments, as well as other missions being considered, have upended the Obama administration’s goal of withdrawing from countries that for more than a decade have been crucibles of combat for the American military. The White House is now considering a Pentagon proposal to maintain at least one base in Afghanistan for years to come, according to American military officials. Senior officials spoke about issues related to Special Operations forces only on the condition of anonymity because most of the specifics of their missions are classified. Harriet Taylor, in a December 28, 2015 article on CNBC’s website is the latest in a series of articles on the evolving cyber threat and what may be the top cyber threats next year. “Headless worms, machine-to-machine attacks, jailbreaking, ghostware, and two-faced malware,” top the list of key cyber threats to prepare for next year.” In the coming year,”hackers will launch increasingly sophisticated attacks on everything from critical infrastructure, to medical devices,” said Fortinet Global Security Strategist, Derek Manky. “We are facing an arms race in terms of security. Every minute we sleep, we are seeing about a half a million [cyber] attack attempts that are happening in cyber space,” he added. The rise of machine-to-machine attacks: Research company Gartner predicts there will be 6.8B connected devices in use in 2016; a 30 percent increase over 2015. By 2020, that number will jump to more than 20B connected devices, the company forecasts. That would mean an average of two to three Internet-connected devices for every human being on the planet. The sheer number of connected devices, or ‘Internet of Things (IoT), presents an unprecedented opportunity for hackers. “We’re facing a massive problem moving forward for growing attack surface,” said Manky. If the objective is to connect the whole world to the Internet, then Free Basics by Facebook (previously known as internet.org) is a controversial method to achieve it. The company wants to provide a subset of the Internet free of charge to consumers, with mobile telecom operators bearing the costs of the traffic. Facebook acts as the unpaid gatekeeper of the platform. In India, Internet civil society activists are opposing Facebook’s scheme for additional reasons. While the attempt to introduce new users to the Internet is a good thing, they argue, the scheme risks breaking the network into many smaller ones and skewing the playing field in favour of apps and services that enjoy privileged pricing. Zero rating in general and Free Basics by Facebook in particular has many defenders among advocates of free markets and capitalism. They argue that if the mobile operator wishes to lose money or cross-subsidise some users at the cost of others, then it should be allowed to do so. Government intervention in pricing usually has bad unintended consequences, and it should be no different in the case of Internet traffic. Can virtualization help mobile device management? As the Defense Department and its workforce become more dependent on mobile devices, mobile device management is emerging as the vehicle to ensure devices are secured and managed in a cost-effective way. MDM enforces policy for end user devices at the application and user levels by instituting end-user permissions for approved functions on the device. “MDM also supports malware detection, electronic software distribution of applications, remote data-wipe capabilities, remote device configuration management and asset/property management capabilities that protect against data compromise,” according to the Defense Information Systems Agency, the lead agency for the DOD Mobility Program. In essence, a unified MDM architecture secures, monitors, manages and supports accredited mobile devices across a range of DOD agencies and services. Virtualization can play an important role in this arena by providing an effective way to segregate and compartmentalize corporate data from personal assets on mobile devices such as smartphones. The intent is to ease the mobile management burdens on organizations while giving users the freedom to use their phones as they see fit. Although MDM is strong in the enforcement of corporate policies on mobile devices, it doesn’t differentiate between personal and business data. As a result, new technologies have emerged to help IT organizations better manage mobile—and employee-owned mobile—devices. The options include mobile virtual desktop infrastructures, containers, app wrapping and device virtualization. With Iraqi forces claiming victory in Ramadi, Baghdad finds itself facing a pair of difficult tests: retaking the Islamic State-held cities of Fallujah and Mosul and then persuading jittery Sunnis that they can trust Iraq’s Shiite-led government enough to return home and begin rebuilding the war-shattered region. Chandigarh, December 29General Om Prakash Malhotra, a warrior to the core who was never shy of fighting for principles even out of uniform, passed away today in Gurgaon. He was 93 and is survived by his wife Saroj, son and former diplomat Ajay and a daughter who lives in London, said sources close to the family. The General was part of that exceptional band of Indian Army officers whose field experience spanned continents and epochs. He was part of a still rare breed of men and women who chucked sinecures on the matter of ethics, as he did as Governor of Punjab in 1991, when his opinion and efforts were overlooked by the Centre. 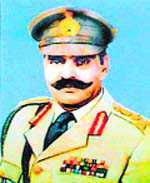 In the pages of military history, Punjab remembers Gen Malhotra with gratitude for the ‘Battle for Sialkot’ during the 1965 war. The thrust by the 1 Artillery Brigade under his command forced Pakistan to thin forces from its main attack column that had overrun Khemkaran and was making a bid to drive a wedge through the heart of Punjab. This Srinagar-born soldier, who had done field service on both of India’s unruly flanks of North Western Frontier Province and the Burma border even before Independence, fitted the bill. Gen Malhotra was not just another officer with a glittering career in the military. He had served as Defence Attache in Moscow and as Ambassador to Indonesia after retiring as the Indian Army’s 13th Chief of Staff. Taking over as Punjab Governor, Gen Malhotra brought about operational seamlessness among difference security forces deployed in the state. He also ordered an amnesty that allowed militants with weapons to surrender. The initiative helped at least some who had picked up the gun to get absorbed into the mainstream. At the same time, the General nudged the state towards elections and tested the waters with municipal polls. Encouraged, the Chandra Shekhar government sought conduct of Assembly elections in Punjab and Chief Election Commissioner TN Seshan gave the go-ahead. As Punjab went into the election mode, the political scene in Delhi changed. PV Narasimha Rao as Prime Minister didn’t want the elections to take place because his party had already announced a boycott. Seshan seemed to have sensed the political wind and cancelled the polls. “I have been through three wars, I have been a General in the wars, but I have never felt as defeated as I feel today after this announcement by the EC that the elections have been postponed," commented a dejected Gen Malhotra while walking out of his office into the sunset and to lasting acclaim. He then took to charitable causes. “He lived a full life. No regrets. It was only in the last three-four days that he had stopped eating,” said a family source. Hari Om Mahajan, Hari Om Mahajan is former Dean, Faculty of Social Sciences, University of Jammu. 29 Dec, 2015 A lopsided policy on the Kashmir issue will surely boomerang and create more problems than resolving the existing ones. Jammu and Kashmir (J&K) is not a normal state; it is complex, and a mini India. It consists of three historically, politically, culturally, ethnically and economically distinct regions of Jammu, Kashmir and Ladakh. Jammu, which was at the helm of affairs in the state between March 1846 and October 1947, is Hindu-majority. Its population is at least equal to that of Kashmir, if not more. Muslims constitute nearly 30 percent of this strategic region’s population. The land area of Jammu is two times that of Kashmir. The people of the region — Hindus, Muslims and Sikhs included – represent the most neglected segment of Indian society, despite the fact that they contribute more than 70 percent of the state exchequer’s revenue every year. It has little or no say in the governance of the state. It’s a region which is sitting on a volcano of discontent. There are many reasons for that. A reference here to at least four of them would be quite in order. One is that the office of the Chief Minister has been with a leader from Kashmir since 1947 and it is being held by a particular religious sect that constitutes only about 26 percent of the entire state’s population. The other is that Kashmir has excessive and a bigger share of representation in the J&K Legislative Assembly and Council of Ministers, which takes policy decisions and decides questions of supreme importance to the well-being and happiness of the people. Jammu has only 37 seats in the Assembly, as against Kashmir’s 46, and its share in the all-powerful state cabinet is a little more than 30 percent. Besides, all the portfolios with political weight, considerable funds and patronage are the sole preserve of Kashmir after the state’s accession to the Indian Dominion in October 1947. Tom Mockaiti International security analyst/military historian. Prof. of History, DePaul University, teaches counter- terrorism courses around the world. The death of six U.S. soldiers near Bagram Airbase on December 21 serves as a grim reminder that while Americans worry about ISIS, the country's longest war is now entering its fifteenth year with no end to it in sight. The tragedy also underscores two additional but often forgotten truths. First, getting into conflicts is much easier than getting out of them. Second, the cost in blood and treasure of virtually every major war that has ever been fought has far exceeded the optimistic estimates of the political leaders who started it. Following this most recent attack it may, therefore, be worth considering a few important questions. What has the war cost us? How did we get into it, and, most important of all, how will we get out? Over 2,000 U.S. servicemen and women have lost their lives fighting in Afghanistan. Thousands more have been wounded, some of them so badly that they will need medical care for the rest of their seriously impaired lives. The American taxpayers have spent more than $700 billion on the conflict and billions more on aide to Afghanistan, much of it wasted on graft, corruption and unsustainable projects. Adding the legacy costs of the war (long-term medical care and disability benefits, etc.) drives the total even higher. In December 15, 2014, when the war was supposed to have ended, the Financial Times reported that it had already cost $1 trillion. The loss and brokenness suffered by the families and friends of the casualties are beyond counting and compensation. Ironically, the war began as one of the most justifiable in recent history. Following 9/11, the U.S. got the support of both NATO and the UN before beginning hostilities. Even then, the Bush administration did not rush headlong into the conflict. It sent Mullah Mohammed Omar, leader of the Taliban government, an ultimatum: turn over Osama bin Laden or face invasion. Omar refused, and the U.S. conducted a swift campaign making excellent use of Special Forces supporting the Northern Alliance of anti-Taliban Tajiks. Military operations began in early November, and by the end of the year, an interim government had been set up in Kabul. Egypt could be facing a dangerous Islamist insurgency unless the state formulates proper strategies to tackle the fragmented Islamist political scene. Egypt is facing what is shaping up to be the deadliest and most complex insurgency in its modern history. The military-backed ouster of Mohamed Morsi from the presidency in July 2013 fragmented Egypt’s Islamist landscape and set the stage for an unpredictable struggle between Islamists and the Egyptian state. In this environment, some Islamists, specifically the youth, have turned to violence, and the trend could continue. The pro-Brotherhood nonjihadi violent groups these youth have founded could evolve into an armed jihadi rebellion. There are steps, however, that the government and the Muslim Brotherhood can take to head off this long-term insurgency in the making. The state crackdown on the Muslim Brotherhood, Egypt’s largest Islamist group, in addition to divisions within the organization have weakened the Brotherhood leadership and have paved the way for its loss of control over a growing number of members. Various Salafists, ultraconservative Islamists, have rallied around the Brotherhood, framing the struggle with the regime as one between a secular state and Islam. Two increasingly distinct Brotherhood factions have emerged. One embraces confrontational tactics and violence while the other emphasizes nonviolence. In reality, however, many leaders tolerate escalating levels of violence, stopping short of endorsing murder. Brotherhood and Salafi radicals justify political violence as a legitimate tool of protest and encourage youth to adopt violence under the guise of self-defense, religiously justified retribution, and defending Islam. Nonjihadi violent groups mainly composed of Islamist youth began to rely on anarchic violence starting in late 2013. Two years later, these groups have not only persisted but have also grown more sophisticated, conducting armed ambushes and improvised-explosive-device attacks against security forces. Jihadi groups tirelessly attempt to tap into brewing anger and to recruit Islamist youth for their budding insurgency. Disavowing torture, investigating allegations of sexual abuse, ending forced disappearances, and generally improving prison conditions are critical steps the government should take to ensure that radicals cannot exploit such conditions for recruitment.